We have the experience to repair any Jet Ski fiberglass problems that you may have. From complete Jet Ski fiberglass remolding to a simple gelcoat problem – we can take care of everything. No Jet Ski fiberglass job too big or small. We can take care of any insurance claims you have including warranty work for most any Jet Ski made. Jet Ski Fiberglass work is done in house not farmed out to an untrustworthy third party. We have over 10 years of experience with all types of fiberglass repair and restorations. We continue to service our customers from the North Central Washington area including Wenatchee, Cashmere, Crescent Bar, Lake Chelan, and the entire Washington state area. Bring us your damaged Jet Skis and witness for yourself the finished product. With so many years of experience working with Jet Ski and watercraft fiberglass repair, it’s no wonder it’s such a big part of our business. We understand your Jet Ski is an investment and maintaining its appearance is important. 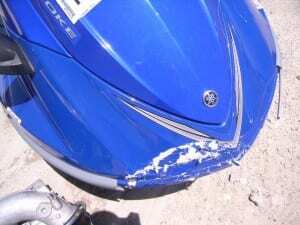 Contact us now and let’s talk about your Jet Ski fiberglass repair.